adidas has today launched the all-new Energy Mode X 18+, a boot designed to unleash the speed of the game’s most dangerous players. Released as part of the adidas upcoming World Cup pack, the boot takes inspiration from previous adidas models while being brought up to date through modern tooling and innovation. After a succesfull year with the awesome adidas X 17+, adidas is getting for the World Cup with a boot update. Therefore, the brand's speedboot is no longer called X 17+, but now you have to get to know the X 18+ instead. And it's definitely not just the name that has changed, as adidas has added some awesome innovative technologies to the ultra popular boot that is to be worn on pitch by some of the game’s biggest players like Mohamed Salah and Gabriel Jesus. “The World Cup is the pinnacle of any player’s career. The challenge for us as designers is producing a boot which highlights the natural talents of these incredible athletes on the world’s biggest sporting stage. With the new Energy Mode X 18+ we have produced something that is really lightweight and minimalist in its design, which removes the barriers between foot and ball while still achieving the elite touch and support at high speed required by the game’s most explosive players. 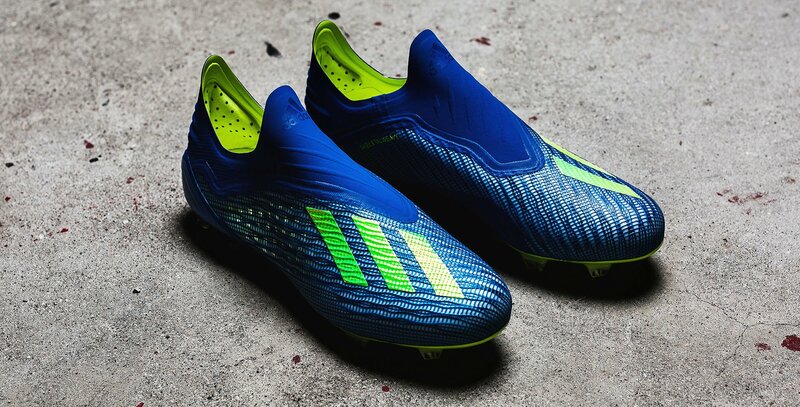 As we continue to innovate in footwear design, we believe this product opens up new potential for players and can’t wait to see them in action in Russia,” says Sam Handy, adidas Vice-President of Design. The adidas X 18+ is designed with new innovations to provide stability and support at high speed. A laceless upper locks-down the mid-foot, crucial when accelerating and during high speed moments. It also ensures minimal interference between the foot and ball. A new low-cut Claw Collar construction features a new stretch material that secures the foot in place and provides increased stability and support. An updated Speedframe outsole features lightweight, Drillium engineered tooling and minimalistic construction to offer extreme traction during rapid acceleration. A 3D Moulded Heel provides a snug and stable fit, designed to lock the foot in place during acceleration. Innovative materials ensure complete control even at high-speed. The Skeletal Weawe is compiled of an ultra-thin woven grid of optically charged speed yarns to allow for responsive touch and lightweight feel. The new, ultra-soft Speedmesh offers a controlled touch without restricting the movement of the foot. You can pre-order your pair of the brand new adidas X 18+ right here.